Steve Hodder, 55, was about to board a train at London Bridge rail station when his heart stopped beating and he collapsed on the platform. He had suffered a cardiac arrest. Steve was lucky. There are eight defibrillators placed around London Bridge rail station. These machines deliver a shock to restart a person’s heart. 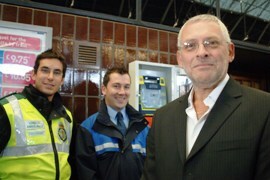 Network Rail Station Officer Eddie McDermott was on duty that day, and was trained to use a defibrillator. Eddie reached Steve within a couple of minutes and started to use a defibrillator to shock his heart. When Motorcycle Paramedic Jez Loseby arrived a couple of minutes later, Steve’s heart was beating again.